It's always a good day to hydrate and if you're out in the sun most of the time, water just don't cut it nowadays. I often don't drink water because I don't like how it tastes like. I'm not a fan of plain jane drinks, but I've always made it a point I do have enough so I could survive and live another day. My usual alternative are juices, and I don't like those super sweet ones. I want it more natural, without having to resort to powdered juice drinks because that too is laden with sugar. We're trying so hard to live healthy and I'm glad life is easy because there's Coconut water available in groceries and convenience stores in the Philippines. Mind you, it's pure organic! There's a new one in town called LOCALLY Merci Buco (which is a play on the French word for Thank You! ), and I absolutely like the original variant. This actually comes in a separate line than the juices they already have in the market. Remember the ones I mentioned in our Luneta visit with Nutriasia? They're the same people who released this, and again it's super good! 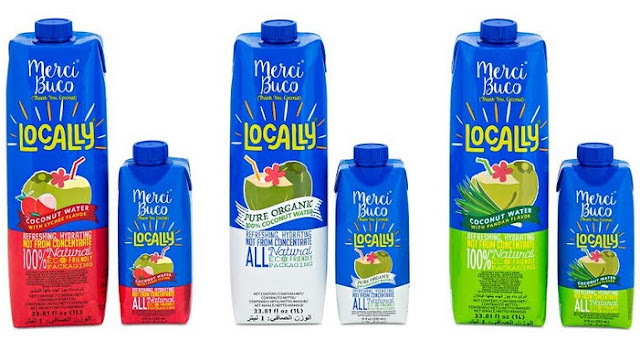 They also released two new flavors this month called LOCALLY BUCO LYCHEE and LOCALLY BUCO PANDAN. These fruits and leaf flavor are quite common in the Philippines and as you've seen in the other LOCALLY juices (Mangosteenie Miney Mo, Tamarind My Bell, Dalandan It Again, Guyabano-body but You, Calamansi’z the Day, Pomelong and Lasting Love and Save the Best for Sineguelast), they've made sure you're right at home for every 330ml and 1 L pack of LOCALLY MERCI BUCO. Still all 100% natural, you won't have to worry about artificial flavors they put in these drinks at all. It's available in Rustan's Supermarket, PureGold and Robinsons Supermarket branches nationwide. You get the nice electrolytes, vitamins and minerals in each tetra pack as you would in a normal coconut because it's the first of it's kind to be certified by US Department of Agriculture. You can't really beat that! Visit Locally Philippines on Facebook and @LocallyPH on Instragram for more information about these drinks! You've got 3 easy choices, now head on to shops and hoard them before they're gone! Drink up!